Free Shipping Included! 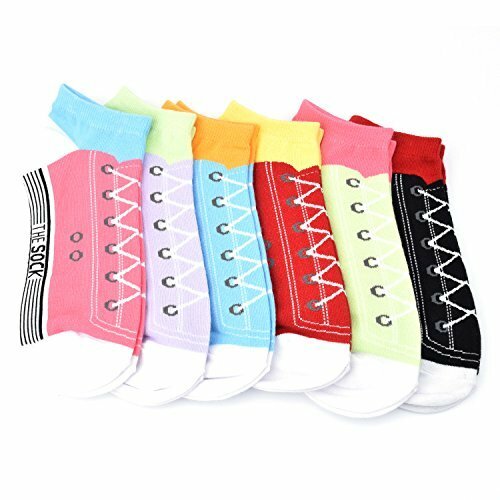 The Sock Womens Ankle Socks 6-pack Comfortable No Show Sneaker Socks by The Sock at Ultra Fitness Tech. MPN: 43189-158258. Hurry! Limited time offer. Offer valid only while supplies last. The Sock's no show sneaker sock for women puts the fun in functional. Comes in six (6) different colors to matchwith all of your favorite outfits. and stitching. Perfect for lounging and relaxing for a day spent at home. The socks are made with combed cotton which is smoother and softer than regular, untreated cotton. The sock is made of 18% polyamide fiber for added durability and stretch. Come with a detailed sneaker pattern design in 6 different colors (black, yellow, red, turquoise, pink and purple). The low, no show cut offer better circulation for a comfortable fit and healthier feeling feet. COMBED COTTON - These socks are made from 80% combed cotton for a more comfortable feel. The cotton is specially treated before being spun into yarn. This pre-treatment process refines the cotton making it smoother and a softer to the touch. POLYAMIDE FIBERS - Eighteen percent of the sock's material is made of polyamide fiber (the remaining is 2% spandex). Polyamide fiber is very durable, but unlike polyester, it retains a significant amount of flexibility---giving the sock an easy, more comfortable fit. SNEAKER PATTERN DESIGN - No need to cover up your feet with footwear---these socks look just as cool by themselves. Throw on the sneaker sock for a quiet day at home. The shoe lace pattern design and detailed stitching make this sock fun to wear and look at. 6 DIFFERENT COLORS - Six pack means six different colors to choose from. Wear a different pair for each day of the week, or throw on the pair that best fits your mood. With the colored sock opening use a pair to accentuate or go with a particular outfit. Good for casual and informal get togethers with family or friends. NO SHOW LENGTH - The sock's no show cut will always fit snug and comfortable. are perfect to wear in warmer weather with a low cut casual sneaker. No show offer better circulation for added comfort and healthier feet. If you have any questions about this product by The Sock, contact us by completing and submitting the form below. If you are looking for a specif part number, please include it with your message.